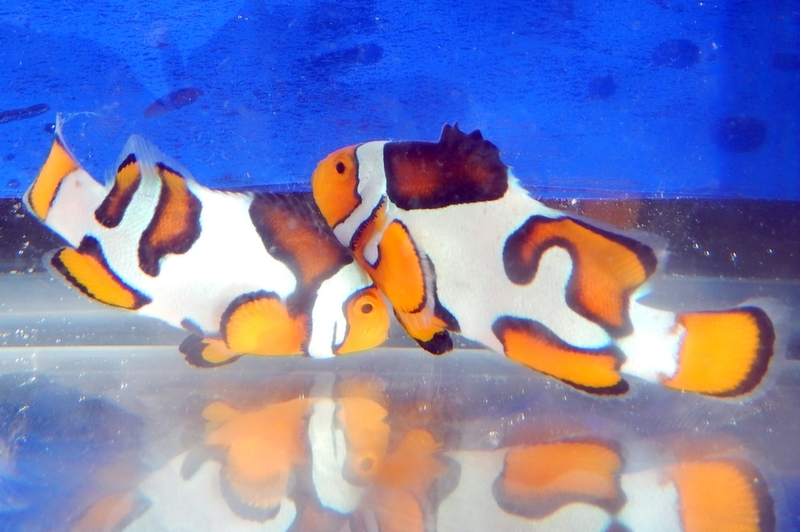 ORA Premium Picassos are an extremely rare and highly sought after variant of the Percula Clownfish. The Picasso variant occurs naturally in the Solomon Islands and Papua New Guinea however it is exceptionally rare. ORA’s strain of Picassos originated in 2004 from a single wild male from the Solomon Islands, which was paired with a typical Onyx female. In subsequent years they have added additional wild collected Picassos into their breeding program. Most Picasso clowns in the industry can be traced back to ORA’s breeding program. This pair is WYSIWYG and has been in our store for over 1 month, is eating anything we throw at them and is about 2" - 2 1/2"
Size 2" - 2 1/2"